The basic concept was the same as the original 1953 Corvette; a two-seat fiberglass-bodied sports car blending power, performance, and style. But the 1963 Corvette saw major improvements: a new frame with all-wheel independent suspension, a redesigned sleek nose housing pop-up headlights, and a coupe body with a distinctive two-piece rear window. Second-generation Corvette history begins in 1957 with an experimental race car built for Sebring competition. Developed under code name XP-64, the SS racer was light and fast, using many aluminum parts. The tubular space frame was similar to the Mercedes-Benz 300SL frame. Although the SS was designed as an open-top roadster, a plastic top could be added to meet varying sanctioning rules. Several projects and several years later, GM began the XP-87 project, an experimental race car called the Stingray Special, Headed by stylist Bill Mitchell, the open top car used the same chassis as the 1957 SS racer. Due to the racing ban at the time, the Stingray was privately raced in 1959 and 1960. Soon after the car appeared as XP-755 Shark show car, and later renamed Mako Shark I. In October of 1959, the first full-scale clay model of the new Corvette was completed. Internally called project XP-720, a second full-size clay model, completed in April of 1960. looked very much like the 1963 production Corvette roadster. The Jaguar XKE, appearing in the spring of 1961, prompted Chevrolet to move quicker towards their new Corvette. After seven years of design and planning, the 1963 Sting Ray (now spelled as two words) began production in the summer of 1962, and offered to the public on September 28th. Designer Larry Shinoda, under the styling direction of Bill Mitchell, is given credit for the final design. Bill Mitchell had envisioned the 1963 Corvette with a full-length spine, starting with a central hood bulge, continuing over the roof, and running the rear window into the car's tail. At the center of the rear deck, a racing-style gas-filler cap was used. The tops of the doors were cut into the roof, easing entry and exit in the low-slung coupe. To emphasize the ridge, Mitchell called for split glass panels to be used for the rear window. forming a complete visual connection with the central raised sections on the hood. The rear view of a 1963 Corvette Split-Window Coupe has become one of the most iconic images in classic car history. 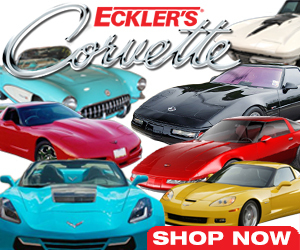 There was no trunk-lid on the 1963 Corvettes, nor would there be until the 1998 Corvette. A hatchback (like the Jaguar XKE) was considered, but ruled out for cost reasons. Storage access was from the inside only, behind the seats. Sports cars previously using this design included the first generation Austin-Healey Sprite. Adding both aerodynamic efficiency and style, hidden headlamps were mounted in rotating housings which were the first for a post-war American car. Other styling cues of the Sting Ray included fake hood vents and optional side-mounted exhaust, The spare tire was housed in a drop-down cradle beneath the rear-mounted gas tank, which now held 20 gallons instead of previous 16. Despite having roll-up windows, the 1963 Corvette convertible was still referred to as a roadster. The top folded away completely when not in use and stored beneath a flush fitting fiberglass panel behind the driver. An optional removable hardtop for the roadster was offered. Gone was the old X-brace frame, the 1963 Corvette used a five cross-member, steel ladder-type design. The center of gravity was lower, with passengers sitting inside the frame rather than on top of it. Different weight distribution placed more weight over the rear wheels. A shorter wheelbase (98 inches as opposed to the first generation's 102 inches) coupled with quicker steering (previously 21.0:1 now 19.6:1), and less weight up front, helped make the 1963 Corvette a better handling car. Like previous Corvettes, the 1963 models were constructed of fiberglass panels, but the new Sting Ray's panels were reduced in thickness to offset the nearly twice as much structural steel used. Both the roadster and new coupe weighed about the same as the 1962 roadster (3100 pounds). The body attached to the frame at eight places, four on either side. Zora Arkus-Duntov was the man most responsible for the C3 Corvette's independent rear suspension. A frame-mounted differential with U-jointed half-shafts were linked by a single, nine-leaf transverse leaf spring. A control arm extended laterally and slightly forward from each side of the case to a hub carrier, with a trailing radius rod behind. The half-shafts powered the rear wheels while also serving as upper control arms. Compared to the first-generation Corvette's solid rear axle, the new independent rear suspension setup made a significant reduction in unsprung weight as well as a dramatic improvement in handling. Front suspension kept unequal-length upper and lower control-arms on coil springs, with a sway-bar fitted as standard equipment. To offset the cost of the I.R.S. suspension, many standard production car parts were used in the front. To this day, many C3 chassis parts are quite available and affordable. Slipping inside the 1963 Corvette, a redesigned dashboard with easy-to-read gauges greeted the driver. There was now a glove box door, a cowl-ventilation system, and improved heater. A vertically-positioned radio was mounted in the center console. Despite a shorter wheelbase, passenger room was just as much as earlier Corvettes. To give the driver more foot room (a negative point of the Jaguar XKE), Chevrolet engineers mounted the engine offset one inch to the right. Leather seats were optional, although only offered in saddle. Four-wheel cast-iron drum brakes of 11-inch diameter were retained from last year's Corvette, but now self-adjusting and wider at the front. Sintered-metallic linings and finned aluminum drums ("Al-Fin") were again optional, giving less unsprung weight as well as faster heat dissipation. Popular options for 1963 included leather seats, air conditioning, power brakes, and power steering. GM's breaker-less magnetic pulse-triggered electronic ignition, first offered on certain 1963 Pontiac models, was also optional. An AM-FM radio became available in mid-1963. Engine choices for the 1963 Corvette remained the same as last years. with four available versions of Chevy's 327ci small-block. The base motor was rated at 250 horsepower with 350 lb/ft of torque. Both it and the optional L75 engine (with 300 horsepower) had 10.5:1 compression ratio, hydraulic lifters, and single 4-barrel carburetor. The L76 and L84 motors shared 11.25:1 CR, the former also having a 4-barrel carb. Alternators replaced generators on all motors. First introduced on the 1957 Chevrolet, the mechanical fuel-injected "Ramjet" engine produced 360-horsepower. Cars so equipped had special badges on both front fenders. The fuel-injected motor was available with only the three- or four-speed transmission. Base transmission was a floor-mounted three-speed manual, with optional four-speed manual or two-speed Powerglide automatic. Midway through the 1963 model year, Chevrolet switched transmission manufacturer; the four-speed unit was now a Muncie instead of Borg-Warner. Standard rear-end gearing for three-speed and Powerglide cars was 3.36:1. Four-speed-equipped cars came with a 3.70:1 gears, with 3.08, 3.55, 4.11, and 4.56:1 ratios available. When new, Motor Trend's Jim Wright tested a four-speed fuel-injected Corvette with 3.70:1 gearing, reporting 0-60-mph times of 5.8 seconds. Standing-start quarter-mile times were 14.5-seconds at 102 mph. Fuel consumption recorded was 14.1 mpg overall. With the 1963 models being the best-handling production Corvettes yet, Zora Arkus-Duntov knew they would be raced. But with the AMA's racing ban for automobile manufacturers still in effect, Zora came up with a way to get a nearly race-ready Corvette into the public's hands. It was called RPO (Regular Production Option) Z06. Created by Duntov, option Z06 gave the buyer a coupe with the fuel-injected 327ci engine, four-speed transmission, and positraction limited-slip differential. Heavy-duty brakes consisted of drums with sintered-metallic linings, power assisted and backed by a dual-circuit master cylinder. Upgraded suspension included a thicker front stabilizer bar and heavy-duty shocks and springs. A 36-gallon fuel tank was optional for long-distance racing. Large external scoops, nicknamed "elephant ears", directed fresh air to help cool the brake drums. Originally offered only on the coupe model, the Z06 option was revised in mid-1963 to include the roadster as well. 199 of these purpose-built Corvettes were built. Built on an aluminum tubular space frame, Grand Sport Corvettes were powered by a 377ci aluminum V-8 engine putting out 550 horsepower backed by a 4-speed transmission. The body panels were half the thickness of the regular car. GM planned to manufacture 100 Grand Sport Corvettes, but only five were actually built. Today, these original Grand Sports are arguably the most valuable Corvettes ever made. Corvette sales nearly doubled from last year, with the coupe and roadster models divided nearly evenly, 10,594 and 10,919, respectively. More importantly, for the first time, Corvette was a sales success for Chevrolet. The 1963 split-window Sting Ray coupe continues to be the most sought-after model of second-generation Corvettes.